Aurion's Game and Technology Blog | Just some random thoughts of mine about games and other technologies. The Donkey Kong Country (DKC) series had a successful revival recently with the game Donkey Kong Country Returns on Wii. As such, you may be wondering, what’s next for the series? I think the best way to see the way forward is to look back at its rich past. In part 1 of this series, I’ll be focusing on its history. Part 2 will be about where the series might go next. This article will focus on the first two entries of the series, as well as Donkey Kong Country Returns. While I’ve played and beaten DKC3 sometime back, I’ve always had a bias against that game, and I’d rather not let that seep into this retrospective. Back when Donkey Kong Country came out in 1994, the Playstation had recently entered the market. Sony was touting the PS1’s polygonal graphics and Nintendo wanted to prove that the Super Nintendo could also produce beautiful games. By using pre-rendered 3D graphics (graphics that are rendered beforehand and then simply displayed on the console), DKC impressed gamers with its visuals. The game sold over 8 million copies, and its success initiated the start of a franchise. Donkey Kong Country obviously played a pivotal role for the series, as it laid down the fundamentals of the games. First, there were the gameplay mechanics within the levels. Donkey and Diddy could both jump and roll through their enemies to proceed through the levels. In addition, they swung from vine to vine, shot between barrels, and bounced on tires. This game also introduced 4 animal buddies (Rambi, Expresso, Winky, and Enguarde), who each had different abilities to help you through the levels. What most people often remember about this game were its mine cart levels, where players had to jump precisely to get through a treacherous track. Ironically there were only 2 of these levels in the entire game! In addition to the land-based levels, there were some water-based levels. The levels were always entirely underwater, and the Kongs themselves could do nothing but swim to avoid enemies in the water (without Enguarde at least). As such, I personally found these levels fairly boring. Finally, there were bonus rooms. These were usually found by reaching secret areas, like breaking a wall with Rambi, or bouncing on enemies to reach a barrel. Throughout the game, there were a couple of levels that were fairly innovative and didn’t fall under the descriptions above (Stop & Go Station for example), but most fell into one of the previously mentioned buckets. The game’s nature-based level themes were fairly generic (apart from the Factory) and the bosses were fairly standard (hit X times by jumping on the boss/throwing a barrel at the boss, two bosses were even repeated). Overall, this game was enjoyed since it created a set of fun gameplay mechanics and the tag-team mode, the ability to switch players at any time. However, as with many first games of a series, it simply laid down the fundamentals that series’ veterans have obviously become very familiar with. When Donkey Kong Country 2 came out a year later, Rare took what made the first game fun and furthered it immensely. Most importantly, DKC2 truly focused on making new and fun gameplay experiences. 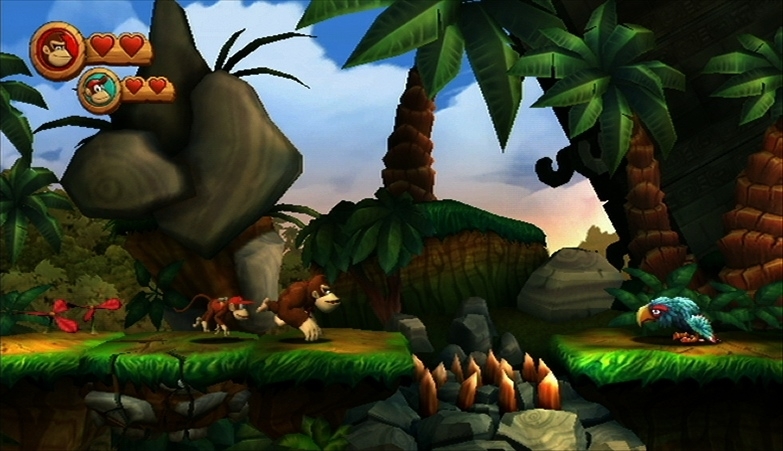 From the start, Rare threw the Kongs into various unique environments, like a honey-filled Hornet Hive, wind filled caves, ghostly levels, funky lava levels, and much, much more. In addition, the presentation only got better, especially on the music side of things. By placing the Kongs in various ridiculous environments and completely ignoring normal laws of nature, Rare was truly able to unleash their creativity, and make a game that many regard as the best in the series. First, Rare not only fleshed out a lot of mechanics barely touched on in the first game, they managed to keep each level feeling fresh. Even within levels primarily using the same mechanics, the game would switch the level up in order to make the player focus on a different goal. For example, one mine cart level was really a race against others, but the next mine cart level was an obstacle course while a ghost chased you. Another time the Kongs would be flying around freely with your parrot buddy Squawk shooting zingers (the hornet/bee-like enemies). However, the next time you’re stuck with a purple parrot that can’t shoot zingers and you can only control the speed of your descent downwards. I could go on and on about the various fun concepts used in the game, but I think this is best understood by playing DKC2 itself. In addition, the game introduced Dixie Kong to the cast, allowing the players to play as Diddy and Dixie. (Donkey Kong had been captured in this game and the goal was to rescue him after all.) Dixie had the ability to slow her fall by twirling her hair like a helicopter among other things. Despite being closer in size than Donkey was to Diddy, Rare made sure that the two Kongs had their differences, and sometimes required that you have a particular Kong for a task. I admit this sometimes ended up being a barrel only usable by one Kong, but it was an incentive to not get hit at all throughout the level. The Kongs also had the ability to throw each other up to higher locations, which led to other types of platforming challenges. I also just enjoyed having two fast and nimble characters as well. Bosses were far more creative and wacky this time, going as far as to make the Kongs fight the ghost of a previous boss at some point. I commented earlier on how the first DKC’s water levels were often rather plain. Rare seemed to agree with that sentiment since they made nearly all-underwater levels in this game highly interactive in some way or the other. DKC2 played around with rising and falling water levels quite a bit, and even was turning lava into water and back again using a seal buddy’s breath! In addition, they added faster and more dangerous enemies to these levels. Speaking of which, animal buddies were utilized better and far more often in DKC2. Squitter the spider, Rattly the snake, and Squawks the parrot managed to allow players to explore the levels in different ways and find secrets. 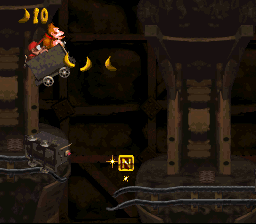 DKC2 had lots of collectibles that were obtained through bonus stages and hidden locations in the levels. Collecting these diligently gave great rewards, including several extra levels and an alternate ending to the game. 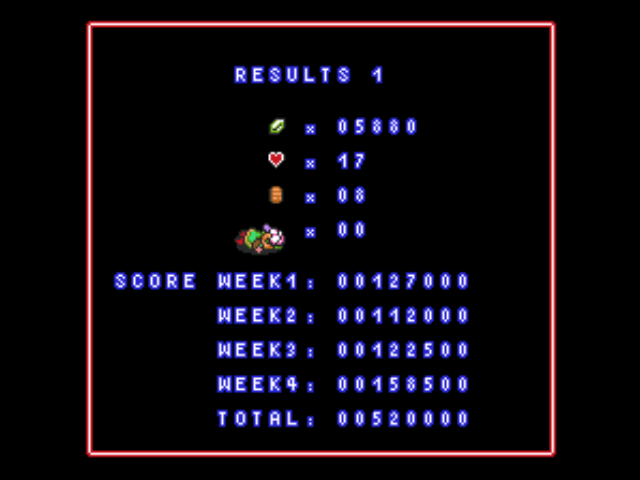 DKC2 also made collectibles a lot easier to manage by recording the amounts collected. In the first game, players knew what percentage of the game they had completed. However there wasn’t really any way of truly quantifying it. Last but definitely not least, DKC2’s presentation was something truly memorable. While the graphics definitely remained superb as those in the first game, it was really the music in this game that made the difference. David Wise and the music staff at Rare really made an outstanding soundtrack for DKC2. The game used its visuals and music in order to create a great atmosphere in each level. The first DKC’s soundtrack generally consisted of more upbeat tunes although it did contain some calm ones. However, DKC2’s music and visuals made you really excited in tense situations like in Haunted Hall, and feel really calm in the gentle atmosphere of Bramble Scramble. It really speaks to a game’s music when I remember its music quite vividly after playing the games over 10 years ago. (I had not replayed the games until recently when I played them again. ), I have remembered so much of this series’ music over the years. However, all the music I remember from this series over the years has been from Donkey Kong Country 2. In addition, most of the environments I remember are also from this game, probably because they go beyond the usual “grass, desert, ice, lava, etc.” levels that have permeated platformers since the days of Super Mario Bros. 3. Donkey Kong Country 2 was truly a sequel that really improved on the original in basically every way possible. Given the vast number of improvements, what else could be improved? DKC2 was soon after followed by DKC3, but after that Donkey Kong took a break from his traditional 2D adventures, apart from the untraditional DK Jungle Beat. With the resurgence in the popularity of 2D platformers, through games like Mega Man 9/10 and the New Super Mario Bros series on the DS/Wii, Nintendo clearly saw an opportunity for a revival of a 2D platforming franchise. Without Rare around, Metroid Prime developers Retro Studios took up the task. Now that the game has been released, praised by many, and sold over 4 million copies, what exactly did Retro do with the series in Donkey Kong Country Returns? For starters, Retro somewhat did a reboot of the series’ cast, by stripping it of all its non-essential characters and replacing the set of enemies. However, I feel that Retro made this game almost a spiritual successor/improvement to the first DKC rather than the second. Retro returned to the natural-filled environments of the first DKC game, while adding a new natural environment or two. DKCR also used Donkey and Diddy like the first game. This time Retro focused on making a unique gameplay experience, by using the technological advancements provided by the Wii that were not there on the Super Nintendo. In DKCR, Retro zoomed out the amount of space visible around the Kongs. First, this view helped DKCR showcase its interactive polygonal 3D environments. Retro tried to make this game gorgeous while using full polygonal 3D backgrounds, and definitely achieved that throughout its levels, like the shadow based sunset level. Having an interactive environment also allowed Retro to be fairly creative, especially with tidal waves, rocks, and enemies having an effect on the foreground from their background location. The levels turned out to be very dynamic, as Donkey and Diddy could interact with nearly every part of the landscape of each level through their jumps, ground pounds, rolls, and gentle breaths. Interestingly, it seems like stereoscopic 3D (like that of the 3DS) would have meshed well these large interactive environments (waves splashing in your face, etc. ), although the zoomed out camera angle may not have worked as well. Secondly, the zoomed-out camera also helped the two player aspect of the game. Of course one major improvement of this game was the ability to play with two players simultaneously. The larger amount of screen real estate allowed for some separation between the Kongs, although the Kongs couldn’t collide with each other anyways. Retro also streamlined a lot of operations, like saving, which was now done after the player completes any level. There are plenty of recorded collectibles (puzzle pieces and the letters KONG) that lead to some bonuses. The presentation of this game was quite good. The visuals were quite varied and well-arranged, although HD consoles and their graphics often can make pretty games on Wii not seem as impressive. The sounds from this game were mostly remixes from the first game. I definitely liked a lot of the remixes and new songs in DKCR and thought many of the remixes were actually better than the original songs. I found it funny though that I had forgotten that a lot of this music was in the original DKC. Overall DKCR was a very good game and well-deserving of its sales. It added enough to be new, without sacrificing any of the qualities that made playing the games fun. Next time I’ll be writing about where the Donkey Kong Country series could go next. In the meantime, I suggest you play the games in this series if you haven’t already, either by buying it on the Wii/Virtual Console, or pulling out your old Super Nintendo if you happen to have one in working condition. Many people fall into the trap of continually buying games that are a safe bet. These are games that have huge name recognition, or are recommended by friends and family. I admit that even though I often read about all the interesting games available for systems like the Wii and DS, I still tended to follow that “safe bet” behavior. Fortunately I decided to try something different and take a chance with a game I was not familiar with. After reading online reviews, I decided to finally buy and play Muramasa: The Demon Blade, a 2D action game developed by Vanillaware. I have to say I’m happy I did so, since I really did end up enjoying the game. First I’d like to start with a brief overview of the game mechanics itself in order to give some context to this review. Feel free to skip this paragraph if you already understand how the game is played. 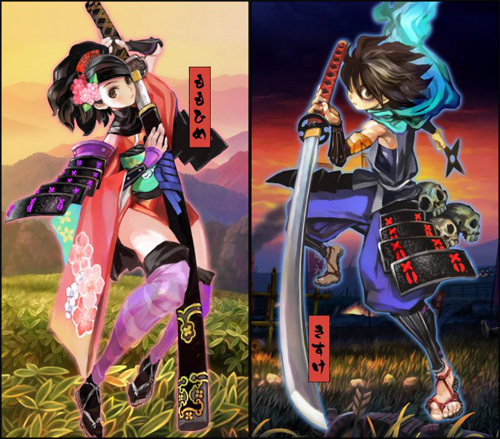 Muramasa: the Demon Blade is primarily a 2D game with both RPG and action elements. The player traverses through a 2D side-scrolling world full of fields, forests, towns, etc. where the player can jump, double-jump, glide, talk to various people, and buy various items and accessories. In non-town areas, the player may enter random battles. These are fast-paced, action-filled battles that involve jumping, dodging, parrying and attacking in various ways with your sword. Completing a battle gives you experience that will level up your character. In addition, your character acquires souls and spirits, which in conjunction with your character’s stats, allow the player to forge new swords. There are two types of swords, blades and long blades, each of which has its own set of standard moves. Apart from that, each sword acquired or forged has its own unique special attack. In addition to normal enemy battles, there are boss battles, where the enemy is smarter, stronger, and has a large visible HP bar. The two stories in this game, one of a princess named Momohime and another of a man named Kisuke, both contain these gameplay elements. Both characters play almost exactly the same, but they each have different stories, bosses, and swords. 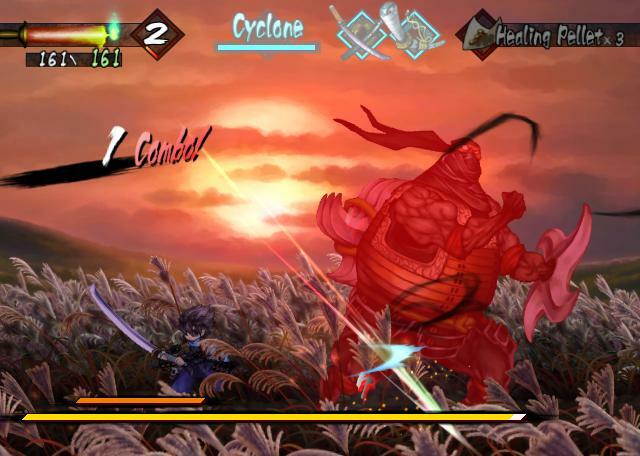 First I want to start talking about the gameplay, which consists of Muramasa’s frenetic battles. After the initial tutorial that goes through all the fighting mechanics, you encounter enemies periodically and must fight them in order to continue. Fortunately the game gives you a bountiful arsenal of moves from the beginning to defeat your enemies. Your characters are able to slash at enemies in different directions, slice through enemies, break through an enemy’s guard, and juggle enemies in midair among other things. Unfortunately, apart from your growing choices of special attacks, this is the same set of moves you’ll have at the end of the game as well. This is where I think how you approach the game can make or break it for you. Since your set of attacks isn’t growing much over time, I feel the game stays fresh if you periodically try to fight in new ways. Otherwise, you may end up fighting in the exact same way every time, which can make the game boring. I took that approach and thus found the game a lot of fun. I learned how to juggle enemies, hit back projectiles, and use the battlefield’s real estate to separate enemies. You’ll be amazed at how fast and nimble both fighters can be with Blades, and how devastating they can be with Long Blades. Blades tend to focus more on weaker strikes and fast attacks. On the other hand, Long Blades are slightly stronger, allow for longer air combos, but need to be properly used in order to avoid getting hit during slower attacks. I tended to favor Blades over Long Blades, but I found it fun learning how to manage both blade types, as you tend to fight quite differently with each. I definitely was happy after battles where I smartly fended off multiple enemies with the skills available. 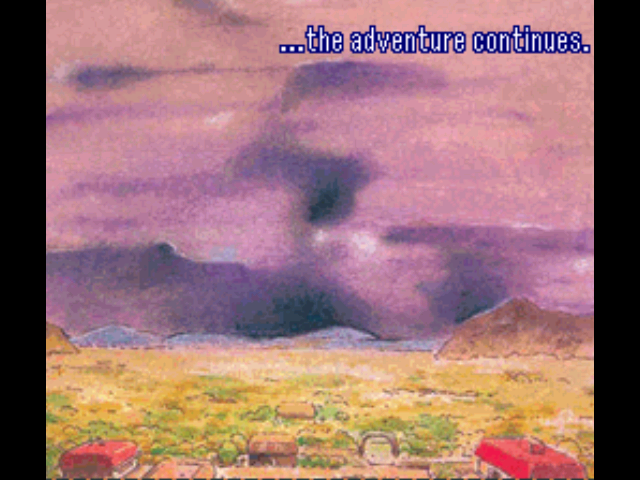 However, I personally felt that the easiest difficulty in the game (Muso) was far too easy. Without somewhat smarter AI and larger amounts of damage, I never felt like actually mastering the battle system. With the Muso difficulty, I felt that I could just button mash and achieve the same result as deftly avoiding the enemies. I started feeling like this in about the 2nd Act of my 1st character’s playthrough, so I decided to increase the difficulty to Shura. This increased difficulty definitely forced me to learn how to play the game properly. This made it so much more fun because I truly felt rewarded for finishing a battle. One good thing is that you can switch difficulty on the fly in the start menu, so feel free to experiment with both difficulties. I personally recommend trying Muso until you get used to the controls and then play Shura for the rest of the game. There’s no real penalty for dying (apart from having to restart a boss battle from the beginning), so dying in a harder difficulty isn’t too frustrating. There are several different types of battle situations in the game. Most normal battles force you to defeat every enemy in a smaller fixed space. At other times, you’re allowed to roam the entire area to fight enemies, but you are allowed to go the next area before defeating the enemies. There could have been more variety here, but I didn’t find it too limiting. Next, there are essentially challenge stages, where you may have to fight like 100 Ninjas without dying, or fight multiple bosses at once, etc. These test the limits of your skill as well as extend gameplay time and replay value of this game. Finally, boss battles are rather impressive in this game. While also being tied to the story, the bosses are very creatively designed. Each boss has various attack patterns that can even involve the environment, like the surrounding rocks or platforms. These boss battles are definitely some of the best battles in the game, and it’s great that you get an entirely different and unique set of bosses for each of the two characters. Outside of the battles, the gameplay is fairly limited, as your character only can use a subset of his or her battle moves, and can’t use the sword in non-battle situations. It mostly consists of running, jumping up branches and hills, and finding hidden sparkling items. This part of the gameplay isn’t too exciting, but this is often when you truly absorb the visuals and the music. I really wish though that all battle moves could be used outside of battle, because it’d allow you to practice attacks as well as move more quickly. The game has a very detailed map for each area, a bit like that of Metroid or Castlevania, that can be used in order to traverse Muramasa’s world. The game makes sure that you know where you’re going, as there is a flag marker telling you which direction to go in. Until after you beat the story at least once, running is usually the fastest way of going across the land, except for the occasional boat or human-held carriage in specific locations. Next, I want to talk about the presentation of this game. 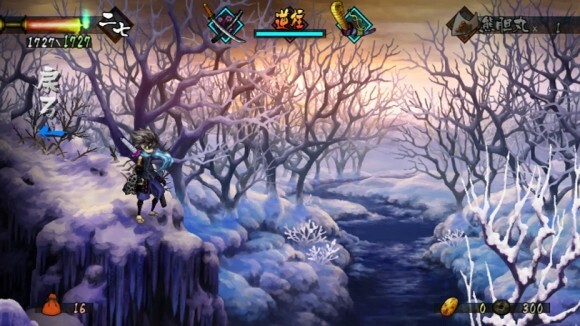 As you can see in the screenshots, Muramasa: The Demon Blade uses beautiful hand-drawn art for the animated backgrounds, objects, characters and enemies throughout the game. Not only does the background scroll as you run from one end of the screen to the other, you can also see further down into the background if you double jump. An example is being able to see the frozen stream at the bottom of a frozen ravine in the picture above. NPCs tend to turn around to face you when they talk to you. Sometimes your character will even take a quick glance at the screen as if he or she is looking at you. This impeccable attention to even the smallest detail in order to make beautiful, immersive, hand-drawn environments is what makes the visuals so impressive in this game. The music and sound effects are no slouch either. Even though the game is set during Japan’s feudal rule several hundred years ago, the soundtrack uses a wide variety of Japanese and western instruments. The music truly ranges from some powerful atmospheric music to some intense energetic music in order to suit the area or situation of that part of the game. Muramasa has a wonderful set of songs to accompany the visuals throughout the game. While traveling, one tune will be playing, but as soon as you enter a battle, a similar battle version of the same song will play for the duration of the battle. This music transition between the two themes is very smooth, and is a nice touch to hear while playing. Not every song is great, but quite a few of them are. I definitely started humming a lot of these tunes even when I was not playing the game. The game’s sound effects seem suitable, and the game’s voice acting seems pretty good, although it’s in Japanese. The game provides subtitles while preserving the original voices. 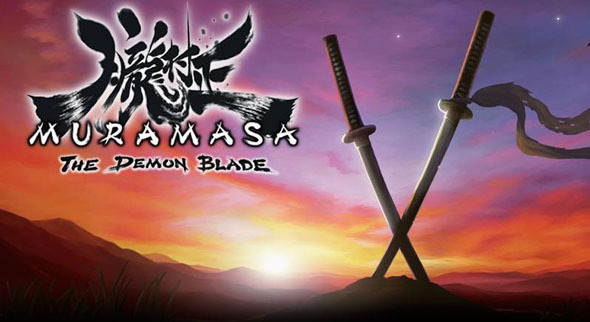 Finally, we have Muramasa: the Demon Blade’s story. While both the stories of Momohime and Kisuke have very interesting initial set-ups, I can’t say the stories are the game’s strongest point. Each story is set in Japan’s feudal era, and deals with mystical creatures like foxes that can transform. Each story took me about 10-20 hours to complete. The stories themselves, however, turn out to be fairly simple. I feel that the stories suffer since it seems some of the words were lost in translation. I can definitely hear things being said by the Japanese voices that don’t seem to be present at all in the English subtitles. Both stories each have multiple endings to find and see, which depend on meeting conditions towards the end of the story. Fortunately all of these can be achieved in one save file. Muramasa: The Demon Blade is a game whose amazing presentation values clearly show at first glance. Fortunately I also feel the gameplay behind this game is also quite good, although it could potentially get repetitive for certain players. I feel peoples’ enjoyment of Muramasa’s gameplay can depend on whether they approach it in a more exploratory fashion or not. Finally, the story isn’t its strongest point, but the story and its characters are decent, and will probably be more suitable to those interested in Japanese culture. I definitely hope people try out this game, and support 3rd parties making games for the Wii like Vanillaware. This game is definitely worth getting if you like 2D action games, especially considering the cheap prices it’s recently selling at. Analysis of Nintendo’s Q3 FY2011 Financial Report – Million-Seller Games, Etc. With sites such as vgchartz and long discussions on forums like NeoGAF about video game sales estimates, there is clearly an audience interested in how well particular games sell. This is not surprising, as a game’s success or failure often determines a company’s decisions about that franchise or genre in the future. In this post I’m going to focus on Nintendo and their hardware and software sales. In addition, I will talk about the games which sold over a million units in these past months (April to December 2010), and Nintendo’s list of upcoming games. All charts and graphs in this post are derived from numbers in Nintendo’s financial report and supplementary report at: http://www.nintendo.co.jp/ir/pdf/2011/110128e.pdf. First, I’d like to briefly describe what these investors’ reports are, in order to help establish where this information is coming from. Companies around the world periodically release financial reports which describe how well a company performed during a particular time period. This is usually meant to help shareholders (people who own stocks/parts of a company) decide whether they wish to keep holding shares in a company. Nintendo of Japan periodically releases financial reports for this exact reason, which contains useful information about the company’s earnings and other finances. In addition, Nintendo also often releases a pdf of supplemental information along with its reports, such as this one: http://www.nintendo.co.jp/ir/pdf/2011/110128e.pdf. These pdfs contain information about games that sold over a million copies, overall hardware and software sales (DS and Wii at the moment), and games they plan to release in the future. Because these numbers come directly from Nintendo, these are the most accurate sales numbers out there (far more accurate than vgchartz and NPD), since Nintendo has the need and the means to collect this information. I will talk about and analyze these three topics for the last financial period (April through December 2010) in this post. 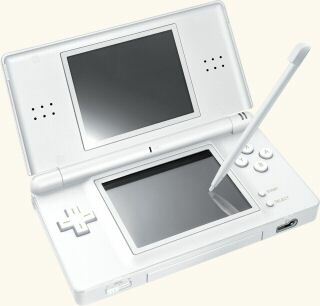 First, we have the Nintendo DS, which sold 15.39 million hardware units so far in this fiscal year with over half the sales occurring in Q3, which contains the winter holiday season in many nations. The Wii sold quite similarly throughout the world, selling 13.72 million units during this time period, and also saw more sales in the winter holiday season (Q3). Seeing as both these sales are the two best selling game consoles on the market this year, I’m sure Nintendo is rather content with the sales the past three quarters, especially considering the 3DS is soon to be released. Software sales are also rather strong for both consoles (Wii: 150.53 million, DS: 98.99 million), but I’ll keep commentary on this short so we can continue on to Nintendo games that sold over a million copies. Ten 1st party games sold over 1 million copies on the Wii between April and December of 2010, which is quite impressive. The usual culprits such as Wii Sports, Wii Sports Resort, New Super Mario Bros. Wii, Wii Fit Plus, and Mario Kart Wii continue to sell well, but 5 new games released this year sold over a million. I first have to give my congratulations to Retro Studios and Nintendo on Donkey Kong Country Returns. This game sold 4.21 million copies in the 8 month period, which means the game is on its way to competing and potentially beating the sales of each of the games in the original Super Nintendo trilogy. I’m happy to see that this game also fared relatively well in Japan, where it sold over 750,000 copies. Nintendo often struggles to get franchises apart from Mario, Pokemon, and their new “Wii” franchise to sell in Japan, but Donkey Kong Country Returns could prove fairly successful there. We also have Super Mario Galaxy 2, which has sold 6.15 million copies worldwide. This game is also selling fairly well compared to its predecessor, and has even broken 1 million units sold in Japan, which is quite a feat for a 3D platformer in the country (it took much longer for the original Galaxy to reach that sales milestone in Japan). The last three titles, Wii Party, Super Mario All-Stars, and Kirby’s Epic Yarn all seemed to quietly sell 5.07 million, 1.95 million, and 1.38 million respectively. Wii Party continues the success of the Wii franchise with its strong 1st year sales. On the other hand, only a limited number of copies of Super Mario All-Stars were made, so a potential reprint could definitely boost Mario All-Star’s sales. Finally we have Kirby’s Epic Yarn, an imaginative Kirby adventure made by the development studio Good-Feel. This game did fairly well sales-wise, although Kirby’s last game, Kirby’s Squeak Squad on the DS, did sell more in a similar time period when it was first released (1.60m in 2007). However, considering Kirby games have generally been more prevalent and popular on the handhelds, the comparison of the sales of those two games isn’t entirely fair. In addition, the game has yet to be released in Europe, so Kirby’s Epic Yarn could do better than Kirby Squeak Squad. One notable first party Wii game that’s missing was Metroid: Other M. By these numbers it seems like that game unfortunately failed to break a million sales. Even in the final year of the Nintendo DS, the portable had 8 1st party titles sell over a million copies. Some notes are that Pokemon Black and White has only been released in Japan, thus the sales are almost entirely from Japan at the moment. Also, Professor Layton and Dragon Quest IX were both published by Nintendo outside of Japan, so these sales numbers only represent the “overseas” sales (Americas, Europe, etc.). While the tradition Mario and Pokemon titles sold well as usual, it’s nice to see the two Nintendo-published third party games sold fairly well outside of Japan. Japan is crazy about both Professor Layton and Dragon Quest, but it has taken some effort for these series to catch on outside of their homeland. Professor Layton has had a growing fanbase in Europe due to its European setting. Professor Layton and the Unwound Future (the third entry in the series) has sold 1.87 million copies within 3-4 months of its release, which is a bit less than the sales of its predecessor, Professor Layton and the Diabolical Box (which had 2.23 million in the same period last year). Both Professor Layton and Dragon Quest are partly made by the growing company Level-5. Recently, it was shown that about 5% of the software sales in Japan come from developer Level-5, who does the animation and graphics for Dragon Quest games and created the Professor Layton and Inazuma Eleven series on the DS. Due to its growing popularity outside of Japan, Level-5 actually plans to have offices outside of Japan, which would allow them to publish their own games internationally as well. In addition to the sales numbers, Nintendo lists both the games it did release in the reporting period, as well as the games it plans to release in the future. The games listed for release this year include Legend of Zelda: Skyward Sword, Pokemon Black/White, Line Attack Heroes in the Americas, and Kirby’s Epic Yarn in Europe. One game that’s happily still included in the release list for the Americas is Monado: Beginning of the World (also known as Xenoblade in Japan). Since this Japanese RPG did decently well in Japan, we can continue to hope that Nintendo of America will localize this game. Last Story still isn’t listed on the release schedule outside of Japan, but that may be because it was too early to make that decision since it had not been released in Japan. Nintendo provides quite a bit of accurate and interesting information in its financial reports, and I hope my summary and analysis of January 28th, 2011’s financial report’s supplementary information will generate more awareness about the information Nintendo provides about its own game sales. I intend to do some analysis on previously released reports (there are reports at least back until 2006), and reports that will be released in the future, so be sure to check in then for more analysis of Nintendo’s financial reports. Nintendo’s next portable console, the 3DS and analysis! Well it seems like Nintendo has surprised me again. According a PDF on the investor relations portion of their website, Nintendo has announced their next portable console. The 3DS, which is its temporary name, will allow for 3D without wearing special 3D glasses. It will also be backwards compatible with the DS and DSi. Not only will it release (probably in Japan) by the end of the fiscal year (March 2011), it will be officially announced with additional details at this year’s E3 on June 15th, 2010. Here are some of my thoughts on the announcement that have come to mind as I’ve put the pieces of information that we’ve received about the 3DS thus far together. I’m actually amazed by Nintendo with this one. First, doing 3D on a portable console is a really smart move in my opinion. 3D without glasses has the problem that it’s hard to maintain the 3D illusion across viewing angles. On a portable system, the amount of viewing angles are already naturally limited. As such, it’s probably easier to maintain the illusion across this smaller spectrum of viewing angles. Also, “developers on the DS2” before have anonymously said this console is rather similar to the GameCube. This information has been going around gaming websites for a while now. On the other hand, Satoru Iwata mentioned in an “Iwata Asks” article that the GameCube had 3D technology that was never used. Maybe the 3D technology on the 3DS has evolved from the 3D technology present on the GameCube. Finally, the timing of this announcement almost seems a little odd. However, since it’s posted in the investor relation part of the site and Nintendo’s fiscal year starts in March, it seems that Nintendo is actually using this announcement as a business decision. I assume this will increase the stock price of Nintendo and future interest in the company. While I admit I still don’t understand the purpose of 3D in gaming, I am excited to see how Nintendo will use the technology in the 3DS! Here are parts 1, 2, 3, and 4 of the guide. Also, here’s some background info and my review of the game. Each episode allows you to play until the in-game clock reaches 18:55. This gives the player about 50 minutes of playtime and the episode ends exactly when the time limit ends. Be sure to complete the dungeons within the time limit and then afterwards feel free to look for heart pieces or participate in sidequests. A score is actually tallied at the end of each episode, and this is based on the number of chests you opened, tablets obtained, heart containers found, etc. You will be able to see your score for each of the weeks on a results screen like the one above. On another note, even when you finish this game you will have two item slots missing. Originally the Magic Cape and the Book of Mudora were planned to be in the game, but neither of these can be obtained normally in the game. Finally, you can choose to be a boy or a girl. The gender of your character only changes the sprite used in the game. Next, there are many time-based events scattered throughout the four episodes. Depending on the in-game clock, there a couple possible weather conditions that can occur. The first of these is rain. During rainy times Zoras roam the land trying to attack you. In addition, bombs will be defused and thus cannot be used to blow up walls outside. The second weather condition is having fog. While the fog obstructs your ability to see certain objects on the screen, it doesn’t seem to have any other effect. These weather conditions appear at particular times and disappear after a short period of time. Of course these weather conditions do not affect you when you are indoors. Another feature that should be noted is that many of the mini-games and sidequests are timed-based. Certain mini-games can only be played at certain times during the hour, and other times NPCs won’t even be present until a specific time. In the original game, the streaming audio alerted you about various sidequests, but here you have to find these yourself. Also, at certain times you will be given certain weapon boosts. For example, you may be given unlimited arrows, bombs, or sword beams. Sometimes, the Bombos and Ether Medallion spells (magic attacks spanning a large area) will be automatically used at a particular time. Here are notes generally intended for experienced Zelda players. 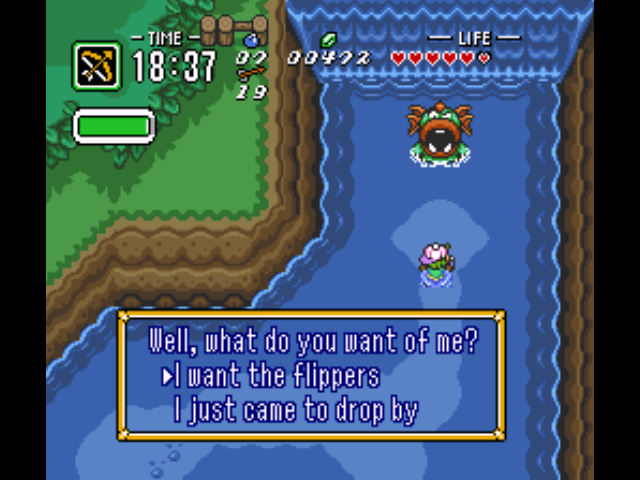 If you have played Link to the Past, the most notable change in this game is with the Pegasus Boots. Now when you use the Pegasus Boots, you not only can turn, but you can continue running past screen boundaries. 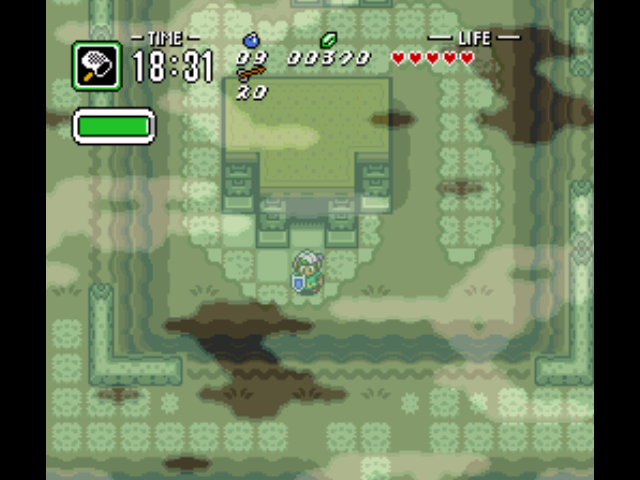 In a Link to the Past you could only run straight, and you would stop running as soon as you moved to another screen. Another major note is how bombs are used against walls. In a Link to the Past, there were always cracks on the walls to indicate that a wall should be bombed. 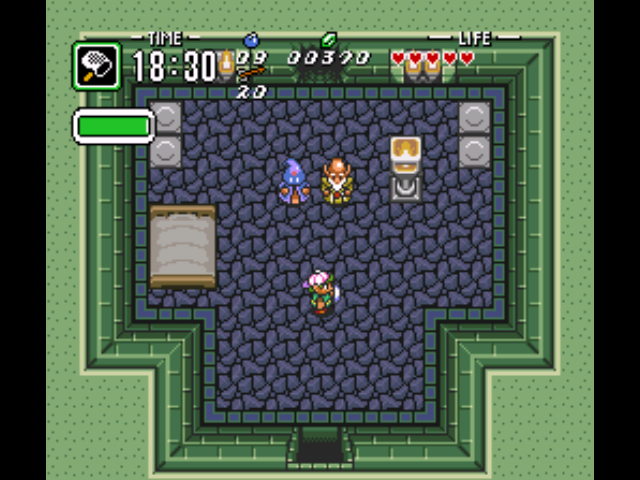 Ancient Stone Tablets has some cracked walls, but otherwise it somewhat returns to what was used in the original Legend of Zelda. This means that most bombable walls will look no different than ordinary walls. 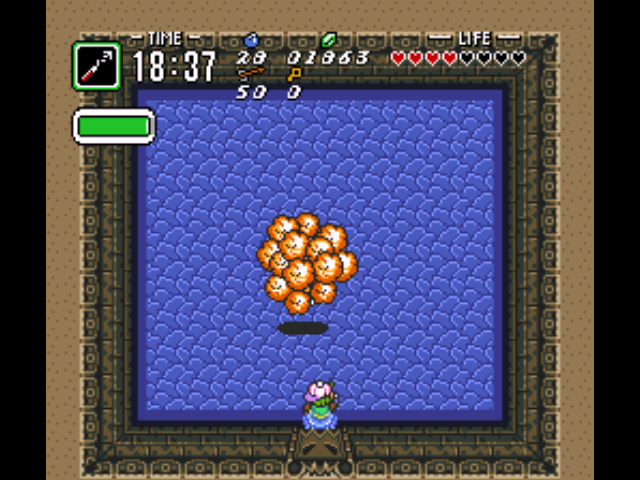 If you swipe your sword at a wall however, it’ll make a different noise if it’s meant to be bombed. Also, you do not need to prod the wall with your extended sword anymore in order to get this different noise. Another way of detecting bombable walls in dungeons is to look at the dungeon map. The dungeon map will indicate the hidden door with a small indent, as it does with any door in the dungeon. If you see an indent on the map but no door present in the wall, it clearly needs to be bombed. Here are parts 1, 2, and 3 of the guide. Also, here’s some background info, the notes before you begin playing and my review of the game. The prologue of this episode is once again the same as the previous 2 prologues. However, this time it adds on a conversation about how the tablets told to get Silver Arrows on a mountain. 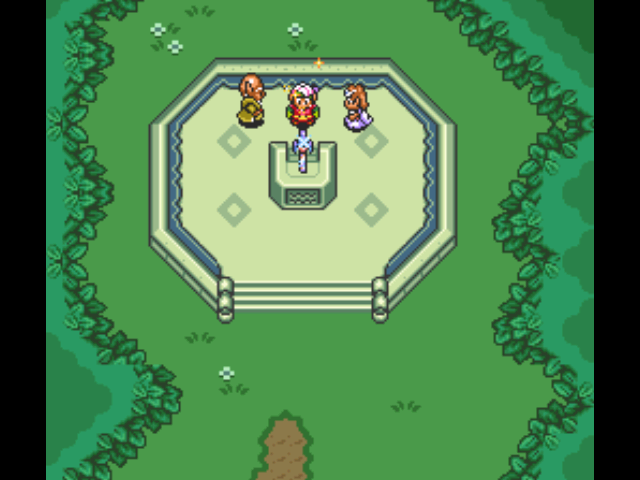 Zelda guesses that it’s on Death Mountain and decides it is time to retrieve the Silver Arrows. Zelda will actually follow you the entire episode, but since she’s since invincible there’s no difference in the gameplay. Next, you start off in the chapel. 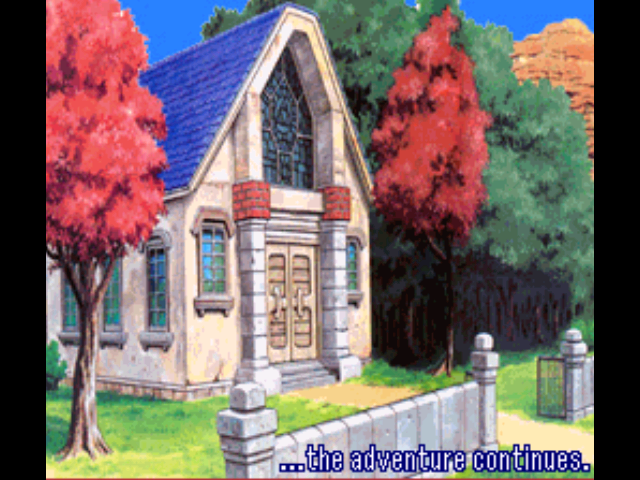 Agihna tells you to proceed to the seventh dungeon in the graveyard, which is right of the chapel. First let’s go one screen to your left and two up. Here you will see two lumberjacks as well as a cave on the upper-right. Inside the cave, light up the four torches with your fire rod to open a door and use the hookshot to cross the gap. There you will find a piece of heart. Now, fly to the Lost Woods. It’s time to get the Master Sword (level 4 sword). First go a little south until you reach a 3×3 patch of bushes. Slice the bushes to find a hole in the middle and collect the heart piece in the cave below. Now, go to the top left portion of the woods and pick up the Master Sword! This should make fighting enemies a bit easier, although I easily was able to go through the 7th dungeon with just a level 2 sword. 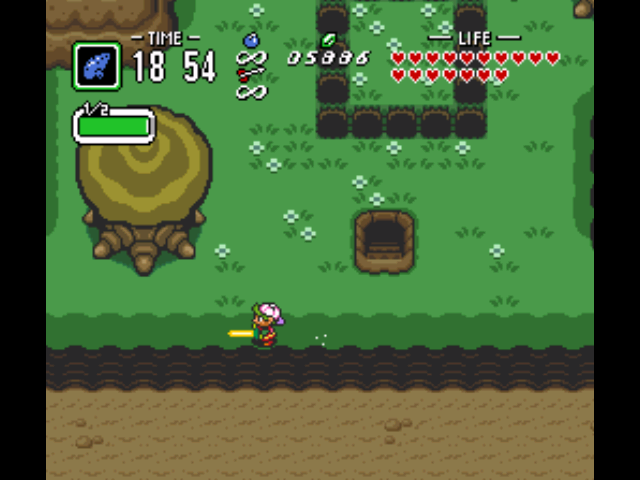 With the master sword, you are now able to shoot out beams when your health is full! Now, go to the graveyard. First actually go to the grave on your far left, push it out, and fall into a hole. Inside you will receive a third bottle and 100 rupees. Now you can go and enter the seventh dungeon, whose entrance is in the grave on your right. Light the two torches in this room to open the top door. 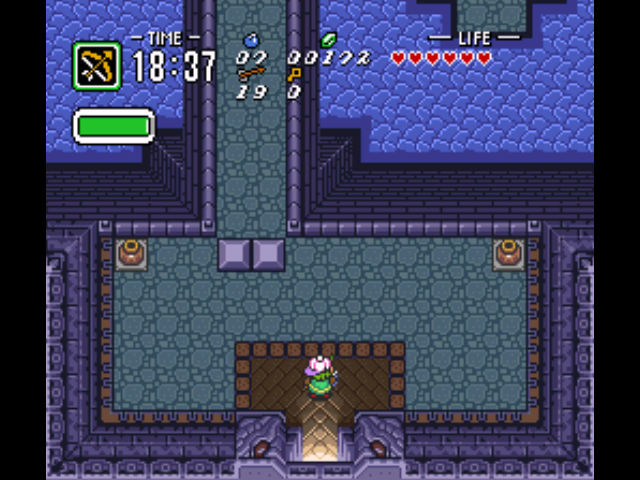 Collect the key using the boomerang and open the chest to find the Dungeon Map. Go back a room and go to the left. Use the hammer on the barrier, use your hookshot to get across the gap, and open the chest on the other side to get the Compass of the dungeon. In the following room, open the chest on the other side to make several holes appear and then fall into a hole. It seems that we’ve now entered an icy region of the palace! Pull the left elephant trunk to open the door. In the next room bomb the left wall to find a secret room. Then hammer the barrier down and pull the elephant trunk to open the door on the left. Inside a thief will give you a bomb upgrade for 400 rupees. Go back 2 rooms and then go down the stairs. Traverse the next icy room and enter the first door you see. Inside there will the powerful gloves, which act like the Titan’s Mitt of a Link to the Past. You can now lift black rocks. Hit the switch, return to the previous room and now head down the stairs on the right. Down here kill all the enemies to open the door. The hookshot can kill the penguins in 1 hit. Go across the ice and spikes by using your hookshot on the left side of the ice. Now open the chest to get a key and go to the room on your right. Use the hookshot to get across the spikes and open the chest to get the Big Key. Go back to the previous room and proceed up the stairs. Here, open the Big Chest to get the Cane of Somaria. This allows you to lay down red blocks by using a bit of magic. In addition, you can make platforms with it whenever a question mark appears over a gap, like the one currently on your right. Use the Cane of Somaria to pass over the gap. In the next room, collect the fairies if you’d like, make sure you have enough magic (there is some underneath the pots in the previous room), and fall down the hole to face the boss of this dungeon. The boss of this dungeon is Kholdstare from a Link to the Past. While encased in ice, he attacks by dropping ice from the ceiling. This ice breaks into four pieces, which you can get hit by as well. Avoid getting hit by the falling ice and melt his ice shell by hitting him with the Fire Rod 3 times. Once he’s free of the ice shell, Kholdstare will split into 3 eyeballs that will circle the room and attempt to run into you. Fight the three eyeballs with your Fire Rod as well. It takes 4 hits with your fire rod for each eyeball. In case you run out of magic, it takes 16 hits to kill an eyeball with the level 2 sword (it probably takes much fewer hits with higher level swords). Once outside of the Graveyard palace, head over two screens to your left. On the far left side of the screen you will see a Piece of Heart partly hidden by a tree. Go left again to reach the fortune teller’s house. Ram into the large rock on the top left portion of the screen to break it. Enter the cave that appears and use your hookshot to get across several spiked gaps. There is a Piece of Heart in a chest at the end of the cave. Now it’s time to head over to the eighth dungeon. So the first thing you may notice is this dungeon looks like a cave. However, the music and the fact that you have a dungeon map are the main indicators that you’re actually in the dungeon. Pull the elephant’s trunk in this room to open the door at the top right. Now go up the stairs and to the left. 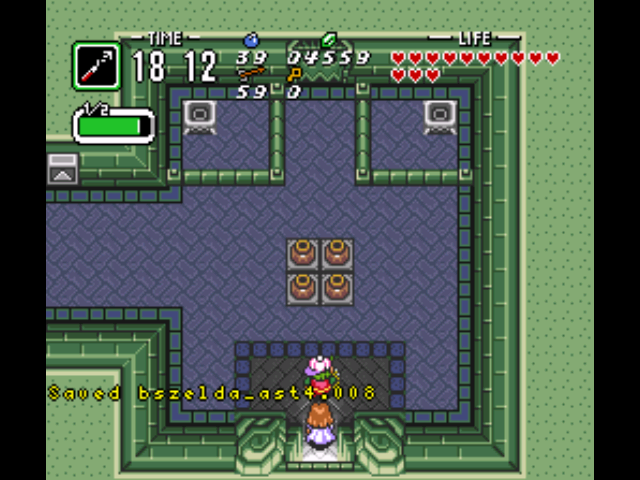 Light the two torches and a chest will appear on the floor below. Go back and open the chest downstairs to get a key. Next go two rooms to your right. Here you’ll see a row of blue blocks blocking your path. Go down to the room below and you’ll find a switch to lower these blocks. After crossing the lowered blue blocks, enter the locked room below and open the chest in this room to get another key. Go down a hallway and then you’ll reach a room with four torches and a switch. Hit the switch to turn it red, and light the four switches to get a key. Go back three rooms and enter the newly reachable entrance. Here turn the switch red, place a bomb near the switch and run down to the other side of the orange blocks. When the bomb explodes the blue blocks will lower and you can continue downwards. The next room will contain the dungeon map. Now go upstairs to the second floor of the dungeon. In this area you’ll only have a spotlight since it’s dark. Pick up the pots towards the bottom in order to reveal a switch. This switch will open the door on your left. There will be four bomb slugs in the next room. There is also a chest with 100 rupees in the bottom-left corner. Use your hookshot to get it if you wish. Go right in the next room and circle around to find a door on the left side of the room. Of course use your hookshot to cross spiked paths while in this room. In the following room, the first door on the right is closed, so go to the left and go across the left gap to get the Mirror Shield (level 3 shield)! Continue on that path to reach the next room. 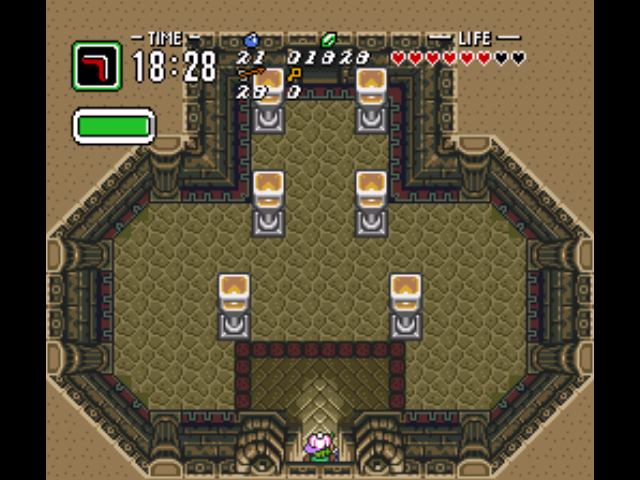 This room has two chests each with 100 rupees in the top-right and bottom-right corners of the room. Go through the right door to enter a dark room with four torches, enemies, and a locked door. Light the torches to get another key. In the next room, navigate through a series of barriers in order to reach the top of the room and go upstairs to the third floor. The third floor is fortunately lit again. Go down one hallway, go left in the next room, and then head up. Make sure not to get hit off the narrow walkways, as hitting the enemies here make you bounce back significantly. This next room has a long narrow walkway that will quickly begin to disappear. Get across to the other side using your Pegasus Boots, but make sure not to be hit off by the hard-shelled enemies placed along the path. I personally find throwing a pot as a very effective way of killing one of these enemies. Now you’ll be in a room with a couple gaps, a door on your right and Wizrobes. Enter the door on your right to get the Big Key. Now go across the gaps you saw before by using your Cane of Somaria on the question mark panels. The next room contains a Big Chest which contains the Ice Rod. The Ice Rod is the ice equivalent of the Fire Rod. You’ll now enter a room with a lot of narrow paths and eye lasers on the right wall. These eyes will only shoot you when you are in their sight. Your mirror shield can block these lasers, but you need to carefully move along so that you don’t get knocked down into a hole. The next room will contain two fairies and some pots. Make sure you have a decent amount of magic and head into the following room to face the boss. 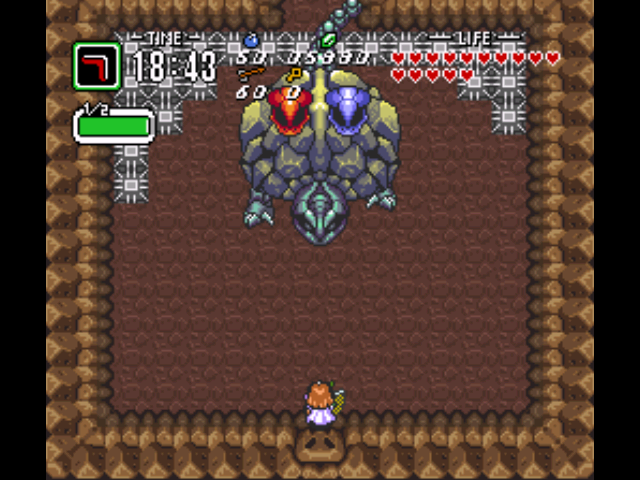 The boss of this dungeon is a weaker version of Trinexx from a Link to the Past. Trinexx has a fire head and an ice head on his left and right respectively. Shoot the fire head with the ice rod (4 hits) and the ice head with the fire rod (2 hits). The ice head makes the floor permanently icy with its attack, so I would kill it first. The fire head shoots out a trail of fire. Once these two heads are defeated, Trinexx will emerge from his shell and start moving around like a large rock snake. Hit the glowing portion of Trinexx’s body three times in order to defeat him. The spikes at the top will disappear and you can go upstairs. Go through another hallway and you’ll be now on Death Mountain. This version of Death Mountain isn’t very large in all honesty. Go up and you’ll see some stairs that go down into a cave. Get some fairies if you want, and bomb the north wall in order to find a piece of heart. In order to get the piece of heart, use your boomerang to hit the switch and your hookshot to get across to the chest. Go across the bridge to find a large statue of the Book of Mudora. Zelda tells you she feels a great evil has been sealed here and that she needs to use the Book of Mudora and the eight tablets to unseal it. She tells you she’ll tell you to return when she’s done. Wait two minutes and she’ll tell you she’s solved the mystery of the tablets. Go back to Zelda to see the seal break. 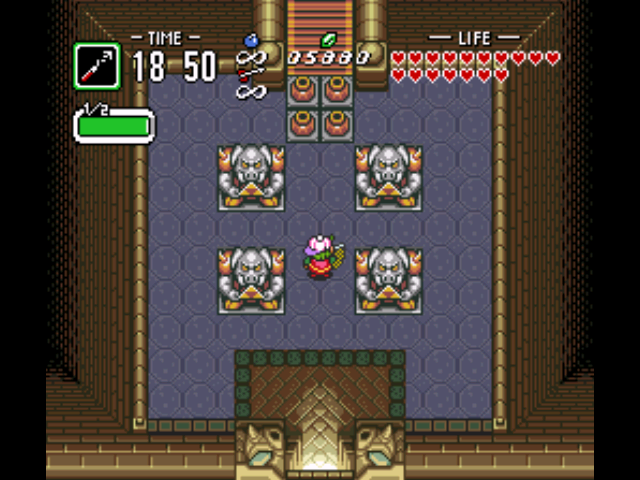 You’ll receive the Silver Arrows, which are holy arrows needed to kill Ganon. Enter the blue warp to be warped to what seems to be the Dark World of a Link to the Past. Ram the rock on the left to find a fairy cave and one last heart piece. 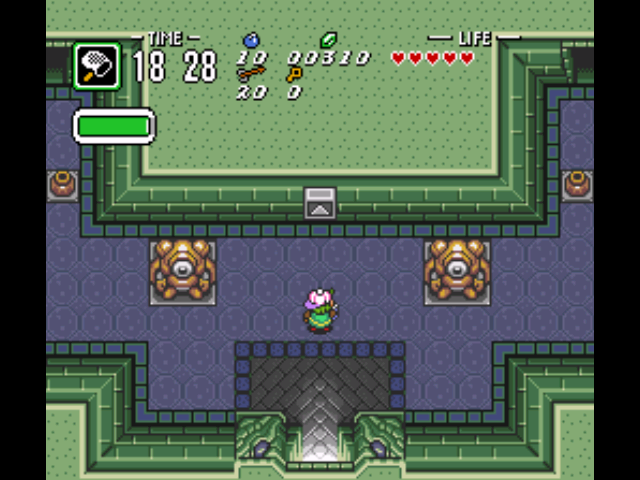 Finally, use the Master Sword to break the barrier on Ganon’s Castle and enter. Just go up two long flights of stairs and fall down a hole to fight Ganon. Ganon supposedly sees some power in you and is going to take it from you. Considering the tablets are with Zelda, I’m not sure what Ganon’s talking about. Anyways, Ganon is the same as he was in a Link to the Past. 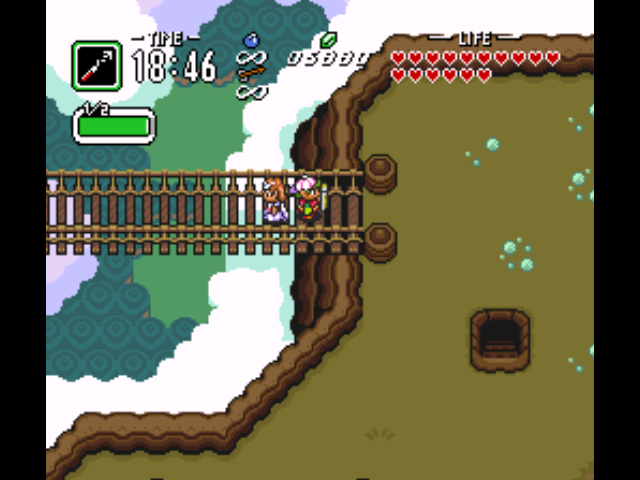 Just like in a Link to the Past, you can actually hit him once before he starts talking if you’re fast enough. Just use your sword to attack him constantly at the beginning. He first spins his trident and throws it over to another part of the room before warping there. His second attack is when he creates balls of fire that circle around him. This circle of fire will eventually expand outwards and then contract, so stay as far away from him as possible. These fire balls then turn into bats that each individually fly towards you to hit you. These bats cannot be killed, so simply dodge them. Ganon has another attack where a fire bat makes circles of fire on the screen and Ganon is constantly warping. Eventually Ganon will shout that by taking your power he can supposedly rule the world. Do you have the Triforce of Courage now or something? What do you have that Link did not have in a Link to the Past? Back then he just wanted to crush you for interfering with his plans. 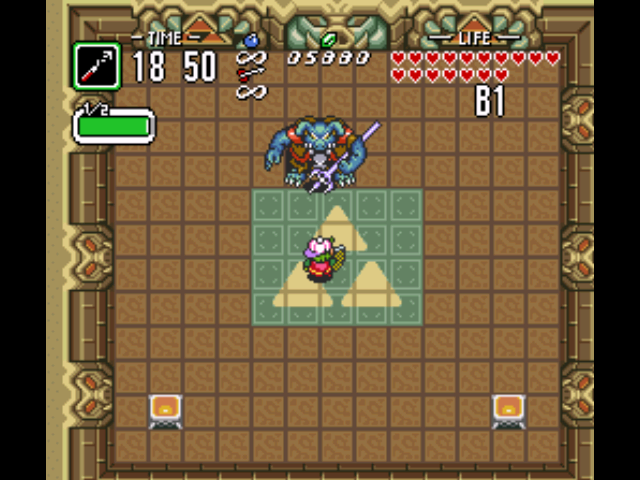 Nevertheless, Ganon then will start using his secret art and the room will turn dark. Dodge the fire bats he shoots at you and light the two lamps. When the lamps are both lit, Ganon will stand still and cover himself for a short amount of time. Hit him once with your sword and he’ll freeze. When he’s frozen you need to shoot him with a Silver Arrow. Repeat this attack pattern twice more and you’ll defeat Ganon. Go back through the red warp and go to the ledge of Death Mountain and talk to Zelda. She talks about how beautiful Hyrule is and thanks you for all your help. You basically can go around everywhere and talk to people who’ll thank you for your efforts. Despite Ganon being defeated again, enemies are still everywhere in Hyrule, so have fun with them if you’d like. Thank you for reading the guide and enjoy the ending! Here are parts 1, 3, and 4 of the guide. Also, here’s some background info, some notes before you begin playing, and my review of the game. So here before the game starts the story of a Link to the Past is told and it is clarified that Link set off to find another new adventure. This would explain why Link isn’t present to face off with Ganon and save Hyrule. Once again, a young child drops down from another world. Agihna and Zelda have a very similar conversation as before, except this time an injured soldier runs in to talk to Princess Zelda. It seems that there were soldiers guarding the Eastern Palace but these soldiers were annihilated by a group of monsters. Now, Zelda and Agihna move towards Sahasrahla’s house in Kakariko village in order to decipher the tablets. You wake up in Sahasrahla’s house and Agihna immediately gives you all your items in another large bag. 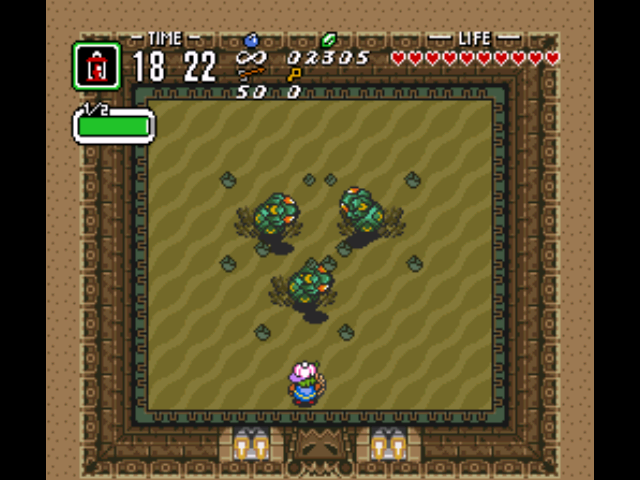 Explore Kakariko village to find a lot of rupees. 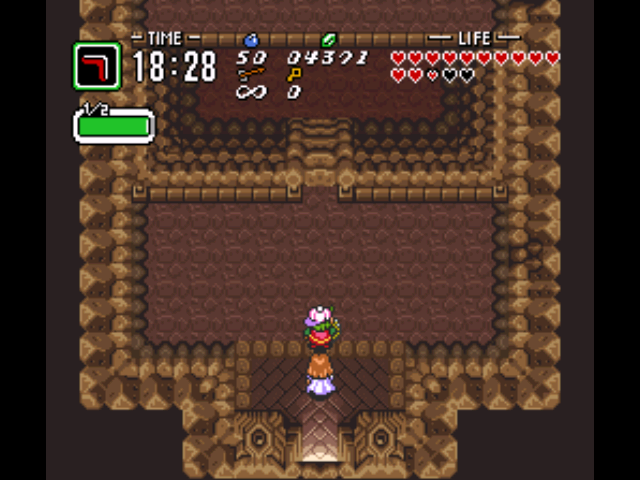 If you enter the top of the long house towards the bottom of the village, you can find a heart piece. Head over to the spot on the map to start the third dungeon. Note at time 18:10 the overworld will get foggy. 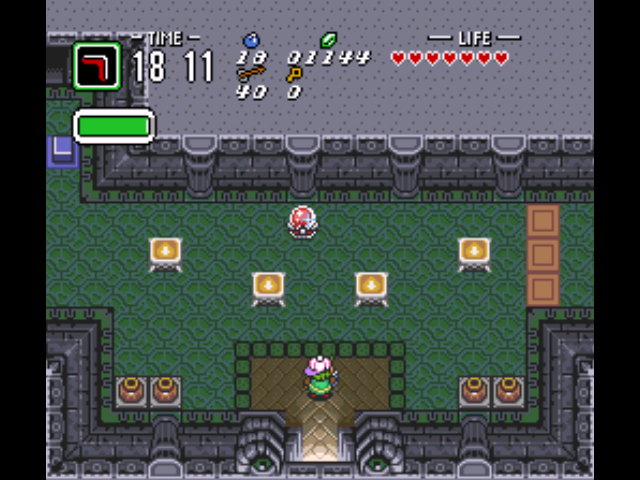 At the entrance of the dungeon, proceed to the right to find some rupees, items, etc. and a couple enemies to defeat. The room isn’t necessary by any means. Next, hit the switch to make the blue blocks drop and go through the top left door. 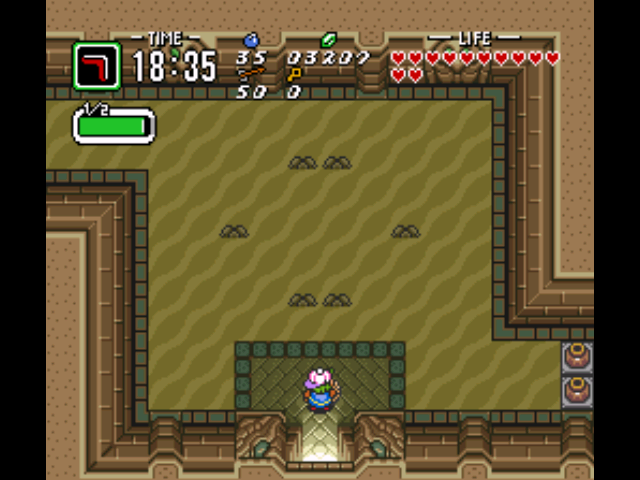 The far left door contains a lot of rupees, but you need the magic hammer to actually reach them. In this room, you’ll see a key on top of the left lamp. Ram into the lamp with your Pegasus Boots to knock the key onto the ground. Then pick up the key, unlock the door and proceed to the next room. In the next room you’ll run into some conveyor belts and a bunch of bouncy enemies. Don’t bother killing the enemies and just go through the top right door. Hit the switch to turn it red in this room, collect the key using the boomerang, and unlock the bottom door. Open the chest in this room to receive the compass. In the next room, hit the switch to lower the blocks, and lift up the top-right pot in order to find a key. Open the door and go up into the next room. Kill the two hard-shelled enemies in this room by hitting them from behind. 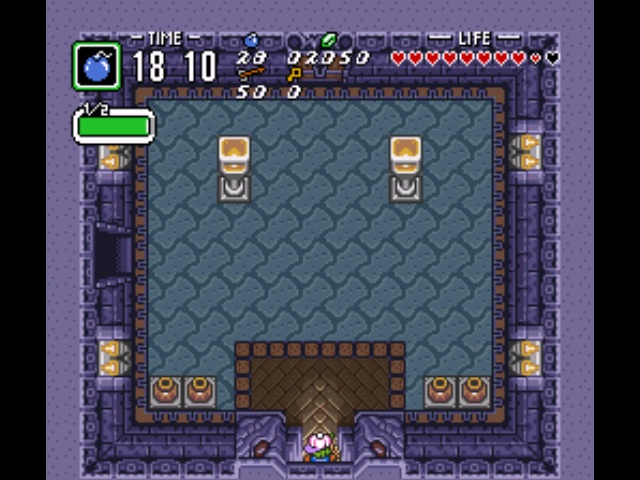 Next, light the two torches to reveal a chest that contains the big key and then go downstairs. Go left into a much larger room and proceed to the bottom of the room. Open the big chest there to receive the Magic Hammer, which allows you drive stakes into the ground. Now head back to the room with the conveyor belts. Here you can access the blocked off rooms by hammering down the barrier. Go to the door on the left directly across the door you came out of (this is in the conveyor belt room). Now if you want to get another bomb upgrade, blast through 3 walls to get to a secret room with another thief (look at your map to decide which walls). Either way, now go downstairs. Here, flip the two turtles over using the Magic Hammer, kill them with your sword, and then pick up the pots in the room to find a key. In the next room, you can either go down past the barrier, or up through a locked door. There’s only treasure and fairies if you jump off into a well down there. Go up through the locked door upstairs and proceed down the hallway to continue through the dungeon. You’ll enter a room with 6 lamps. The door on your right will lead to the boss of this dungeon. 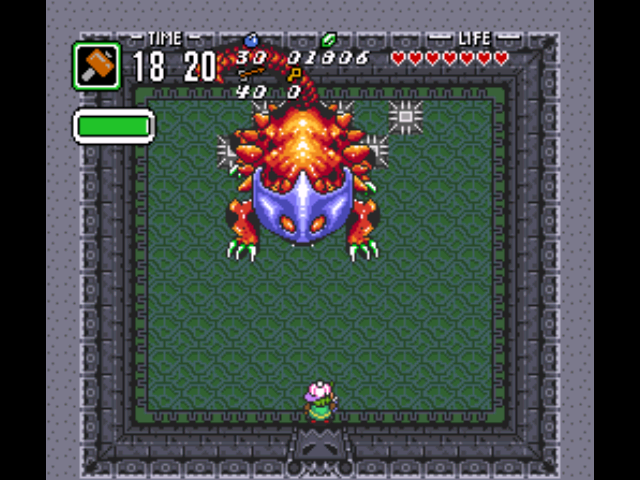 Once again this boss is a boss from Link to the Past and acts in the exact same way. Helmasaur King moves around the room, uses its tail to target you and shoots out fireballs that can damage you. In order to beat this boss, you need to place bombs on the floor and hope he walks over them or near them when they explode. When that happens his face mask will start chipping. 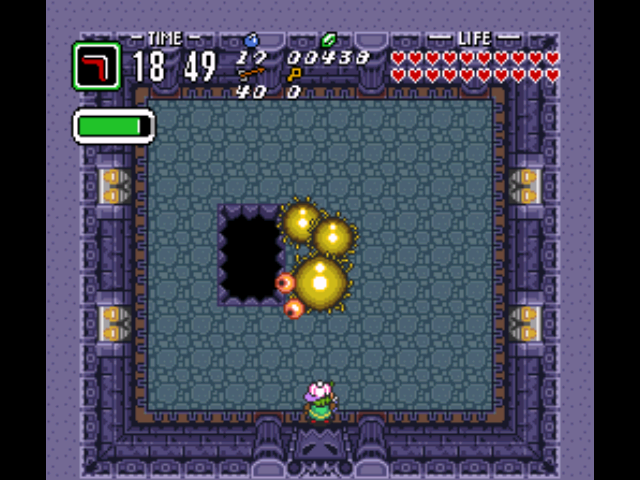 After 3 blasts, the mask will break apart, and you will see that the boss has a large glowing spot on his head. Hit this spot repeatedly with arrows (6 times) in order to defeat Helmasaur King. 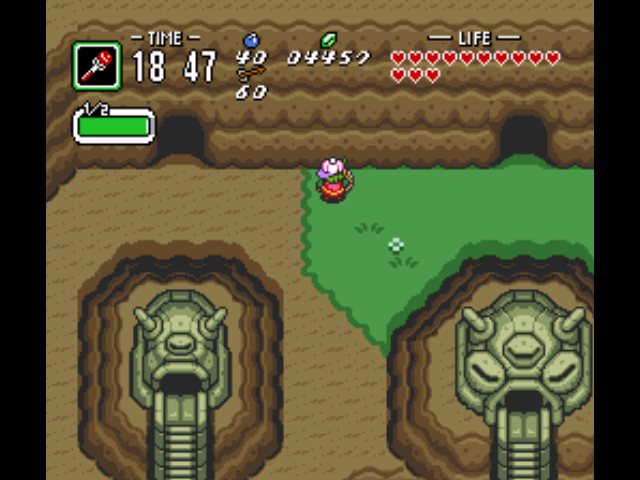 Your sword seems to be ineffective on this spot (unlike in a Link to the Past). South of the village, there is a heart piece inside the library. Knock it off a bookshelf using the Pegasus Boots in order to collect it. There is also a piece of heart in a house on the bottom left portion of Kakariko Village. Bomb the front of the house and enter it to find a heart piece and 20 rupees. 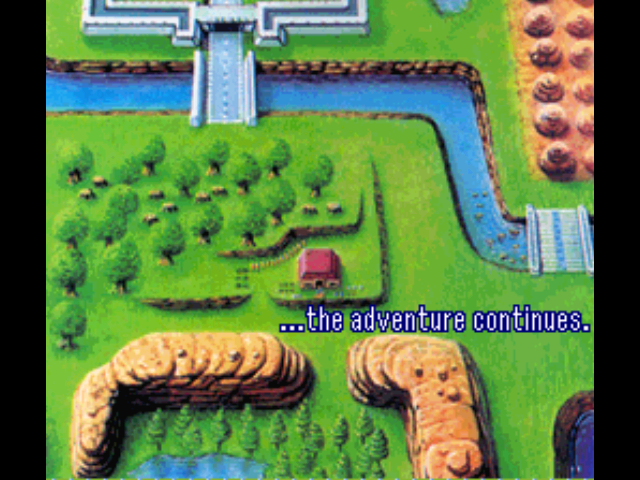 Now go north of Kakariko Village and enter the Lost Woods. Find a blacksmith on the left side of the Lost Woods. Take him back to his partner a little outside the bottom-right hand corner of the village. To repay you, they will temper your sword, making it a level 2 sword! 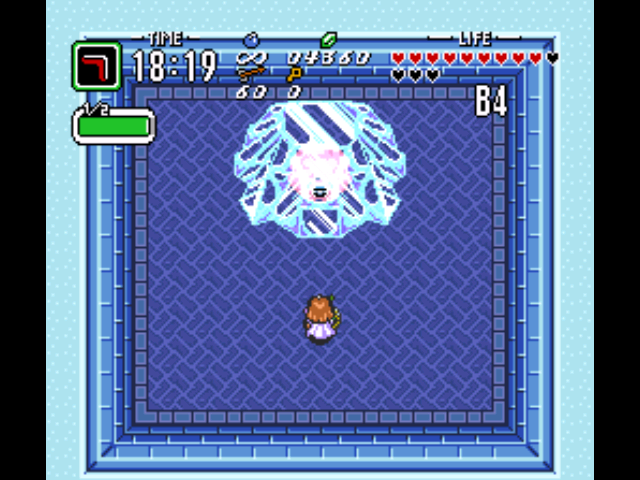 Although this looks like the Master Sword of a Link to the Past, it is not the Master Sword and it does not shoot out beams when you’re at full health. You can also buy a bottle for 100 rupees from the merchant sitting outside. Also, in the lost woods, go to the far left and find a mushroom there. Now fly to the witch’s shop (close to Zora Falls) and have her make you magic powder. Now use the ocarina to fly back to Kakariko village. Go back to the blacksmith’s house and fall down the cave next to the house. This cave will have two doors. Go to the top door and you’ll two stone hands holding a chalice full of some liquid. Use the magic powder on the chalice and a bat will appear. This bat will make you only use half the magic you used to use as a “punishment”. The entrance of the Lost Woods Dungeon is at the top right side of the Lost Woods. Go up through the first room and enter the door on the right of the second room. 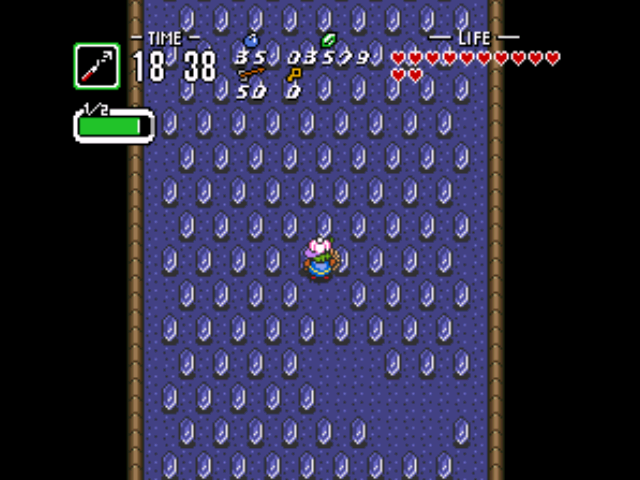 There’s a chest in the room on the lower left, but you can’t cross the spikes without getting severely hurt. So instead proceed all the way to the top of the room full of spiked pits, and fall down through the hole to the floor below. You will fall down two stories. On the floor in between where you start and where you land, you’ll see the big chest guarded by two skeletons. You’ll eventually fall into a room with four slugs. These slugs drop bombs, which do one heart of damage. Make sure not to touch these slugs as you will lose 3 hearts! Kill all 4 slugs to exit the room. Exit the room and go into the next room to find a room with lots of conveyor belts. Enter the room on the right and go up to find a locked door at the top. Light the two torches there to make a chest appear with a key inside. Open the door to enter a room with 2 spiked obstacles moving around. Once upstairs, you’ll find a large room with two wall cannons that shoot balls across the room. Dodge these balls and get to bottom of the room. Pick up the pots to find a switch to open the door. In the next room you’ll find the two skeletons and you will be below the Big Chest room. Go down and stand still at the door. Wait for the big spiked object to start going back down and run towards the left door. Inside this room pull the left elephant’s trunk to unveil another chest. This chest contains the big key. Backtrack to the room with the two skeletons and head towards the Big Chest. Open the Big Chest to find the Hookshot. Come back down and go to the room on the right. Kill all the enemies here. Bomb the top of the room to get an arrow upgrade again. Go the room on your right, and use the hookshot on each of the pots to get across the gaps. Upstairs, use the boomerang to get the key and open the locked door. You’ll enter a room full of spikes and enemies next. Use your hookshot to get around the room and to the exit on your left. You’ll now be at the first big room again. Go to your left to get the dungeon map. Now go back and go to the top of the room and open the door that requires the big key. Use the path on your left to get to the boss door. 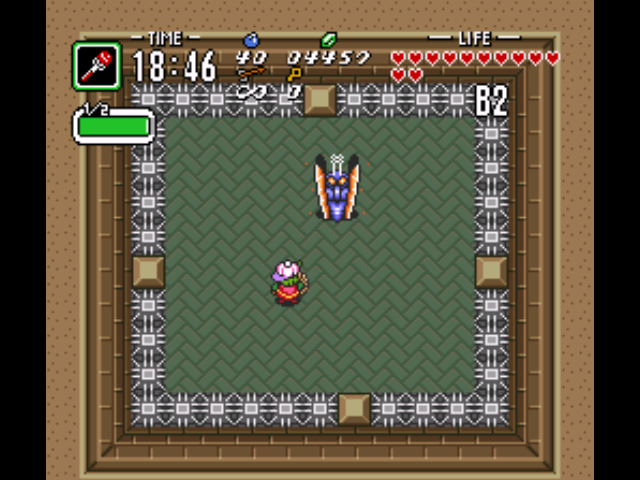 Once again this boss is from a Link to the Past. Arrghus is a big eyeball surrounded by little puff balls. Arrghus is defeated by using the hookshot to bring the puffballs towards you, and killing those puffballs with your sword before they return to the main body. Arrghus will attack you by moving around slowly and sometimes making the puff balls circle quickly around him. Once Arrghus has no puff balls left, he starts attacking you himself by jumping up, dropping down, and moving around the room. Just make sure he doesn’t land on you and hit him constantly with your sword at this point to defeat him. Get ready for part 3 of the adventure! I was not able to find anything that I needed to do at this point. However, I believe it’s possible to find one more heart piece. If you skipped any of the heart pieces I mentioned above, you can go and get them now. You can raise your high score during this time as well. Either way, pass the time until the game clock hits 18:55 and you’ll the next cutscene. Zelda and Agihna discuss how you managed to get two more stone tablets. However, no one seems to be able to interpret the meaning of them. Zelda remembers that Link used to have the Book of Mudora at his house. She believes that this book could help solve their problem. Since the route to Link’s house is now very dangerous, Aghina accompanied your character to Link’s house, which you will get to explore next chapter.